Stuff Points: Earn 40 points when you buy this stuff. A simple bowl is home to a three tiered water feature that's also a candle holder. Six vertical cylinders emerge from the lower basin, and each is a different height than the next. Three will collect and direct the water, and the other three will hold real candles. Light them up to enhance the look because the whole thing will become awash in a gentle flickering light. Once tuned on, the included pump will pull water up to the top of the tallest cylinder to fill a small pool. Once it reaches capacity, water will begin pouring out of the spout on the side in order to travel to the tier beneath. It will then fill that pool, and pour out to fill the last one. From there, the stream will flow into the lower basin to pump back up, and continue to cycle. The shimmering streams drop vertically to create a soothing sound similar to a real creek, and it will block out unwanted noises, and help you relax. It looks like it was crafted from natural materials, but it's actually a durable resin that keeps the cost low, and allows you to place it indoors or out. It comes complete with candles and a high powered pump, and it's backed by a one year warranty from the manufacturer. This tabletop model would be perfect for any living room, but it's also nice as an outdoor decoration to improve the appearance of your deck or patio. Easy Set-Up. Includes all parts, and comes mostly assembled with easy to follow instructions. Fiberglass Construction. The durable resin looks like natural materials, but it's much lighter, and far less costly. High Quality. A great design, and quality craftsmanship makes it look amazing, and top quality electronics guarantee it will work as well as it looks. Multiple Tiers. This model has several layers, and three elevated pools to direct water. It also has similar looking candle holders at a variety of heights, mixed in, to add to the visual appeal. Integrated Candles. The perfect contrast to the natural water, but also nice to set the mood. Light the three candles to provide an added effect, and a gentle glow. This model is 11 inches tall, and 9 inches wide on it's longest side. 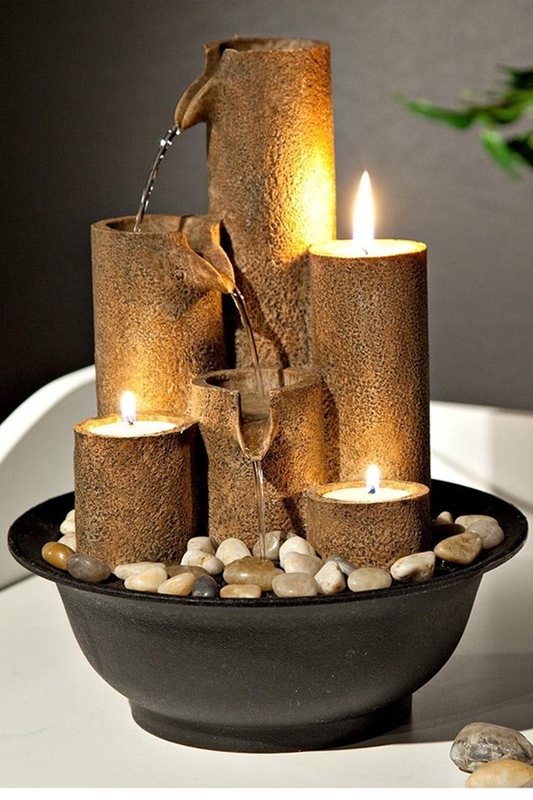 Real candles sit among flowing streams of water to create a relaxing water feature that's perfect for any home. Order Yours Today! Are candles replaceable, and what sizes would be needed? Yes. You can replace the candles with ones you can buy locally. They are a standard size. does this come with an electrical plug? Yes. It plugs into the wall, and it comes with all electrical components required to run it. Does this item come with the rocks shown or do i have to purchase them seperatly? It does come with rocks like the picture indicates. How quiet is the pump? Is it suitable for a bedside table, without the noise of the pump, just the sound of water falling? The pump is nearly silent. This model would work perfect for your intended use.